The first part of the adventure is done now. I counted up that we saw 21 houses. Of those, 6 were of some interest. It was never assured that we could actually find a place and make an offer in the almost 3 weeks we had but in the end, we did it. Now come the crazy times. After we go home we will have our work cut out for us. For me, I have to get ready for my hip replacement surgery. It is necessary and I want to have it done by the time we move to Italy. That will happen on February 12. After I recuperate there are hundreds of things to get done. And hundreds of things to have accomplished in Italy before we arrive. I am sure the apartment will not have the things we need to get started like bed linens, towels, all the kitchen equipment, plates etc. I am not sure how we can get some of the basics before we come. Perhaps Simona can help. After the closing I am thinking of asking Susan to take the keys so she can give them to anyone who needs access. We would like to get the screens installed before we come too. If closing happens on May 30 as stipulated we cannot start to get our visas until then because we have to have the house papers to do so. We may go to the embassy early to see exactly what we’ll need and that may simplify the process after the sale. Because the amount of time needed for this process is unknown we won’t be able to get our flights over and since it will be summer by then that could be an issue. We will have to think about the logistics of it all. Also we will need to put our house on the market and deal with all our stuff. I don’t think it will take long to sell it – it will be at a good time of year – but one never knows. I have found a company called You Pack, We Ship who will send 50 cubic feet of stuff over for a pretty reasonable price. We intend to do that. It is kind of hard to know what we can fit into that space but I am mentally making a list. We will only take what we won’t want to bring back when we come home as I don’t intend to ship back. We will also need to rent a storage space and have the larger items that we want to keep moved to it by a moving company. Then we will have to give away or throw away the rest of our items. Since I am a total planner my mind is spinning! But I’ve done it before so I can do it again. I will update this blog as relevant events take place. This entry was posted in Uncategorized on January 30, 2014 by Nancy Hampton. We met Jim at the Pink Panther and drove up to Citta de Costello. The Notaio’s office was in a beautiful old building with very high ceilings, I’m guessing about 30 feet, with frescoes. We went inside and they did some paper work and then we went into his office. It was an enormous room with a HUGE fireplace and antique desk, long conference style table and velvet covered chairs. All were very old and the chairs were worn but it was quite the place! The funny part was that they had to read the papers out loud. It is a requirement. So after they read them out we had to sign. And not just ANY signature, we had to sign our entire names without lifting the pen. So my cursive writing came in handy. I have no idea why that is the rule – but it is. So now Jim has power of attorney to act on our behalf in the sale. I admit it is a bit of a leap of faith on our part but he comes highly recommended and has done business in the area for 30 years. Everyone seems to know him. SO we are going with our gut on this one. Hope for the best! Next we completed the bank account opening, getting on line banking set up and our bank o mat card. Jim told us that the sellers want their price and agreed to let us have most of the furniture. They are not letting us have the big sofa, sadly, so that will be a number one priority when we move here. The last thing we have to do is transfer the 10% deposit money and we have twenty days to do so. We can wait until we get home which is good. We had lunch in one of our favorite places here, il Capponi. We’ve been three times now. They have terrific pastas and some are very unusual in my opinion. Everything has been great on all occasions. We are going to Perugia tomorrow. Originally we were going to meet friends Ron and Linda but Linda has come down with a nasty winter cold so they have canceled. We decided to proceed on our own. We are going to drink some champagne tonight! This entry was posted in House Hunting, Real Estate, Umbertide, Uncategorized on January 29, 2014 by Nancy Hampton. After a relaxing weekend when we visited Gubbio again and had a lovely lunch on Saturday. It was mighty cold! The Appenine mountains were beautifully snow capped. On Sunday Susan and Gary invited us to lunch and to meet some of their Italian friends and helpers, Simone, Simona and Fabio. It was a lovely lunch of assorted antipasti and a rolled pork dish with beans and zucchini. A ricotta tart was the dolci to finish. We really enjoyed meeting their friends and the lunch was delish. We have not heard whether we have gotten the house yet but should by tomorrow. We had an appointment with Jim to go to the tax office and get our Codice Fiscale stamped and official. It took very little time with a serious government worker. Then we proceeded to the bank to open an account. That took a while with many, many papers to sign. Jim will be our agent until the house is bought so he has access to our account. We applied for a bankomat card and on-line banking. We exited the bank into a horrible sleet storm. We bade Jim goodbye until tomorrow morning when we will meet him at the Pink Panther (really!) which is a café near his house tomorrow at nine. We will go to Citta de Castello to meet with the Notaio to sign power of attorney for Jim to transact for us. A Notaio is a cross between a Notary and a lawyer. They handle all the legal stuff on the sale. We went to Bar Mary and had two more cappucini. We have learned to say senza schuima which is cappuccino without the foam. More coffee but just as good. Oh and on Saturday we ordered machiatto after lunch which here is espresso with a little cream. Very nice. I like it much better than espresso black. Since the weather is so vile we ducked into the little alimentari to pick up something for lunch in the apartment. The proprietor is just the friendliest man. He tells me the names of the things I want and I repeat them back. He is so nice. We bought onion bread, baguette, cheese and ham. We decided to eat our lunch in and eat in the restaurant that is almost directly under us tonight. It gets mixed reviews from the people we have spoken to. Most don’t like it. We decide to try it ourselves and form our own opinion. Right now we are sitting in front of our little stove all toasty and warm. A while ago we got a call from Jim. He is now in negotiations for the furniture. They rejected our lower price. I hope they are more willing to throw in the furniture we are asking for. We shall see. 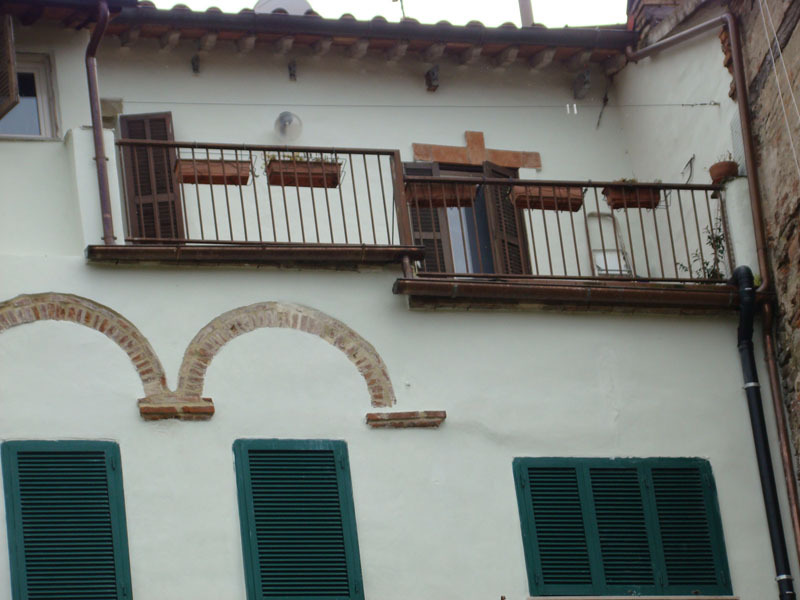 This entry was posted in House Hunting, Real Estate, Umbria, Uncategorized on January 28, 2014 by Nancy Hampton. 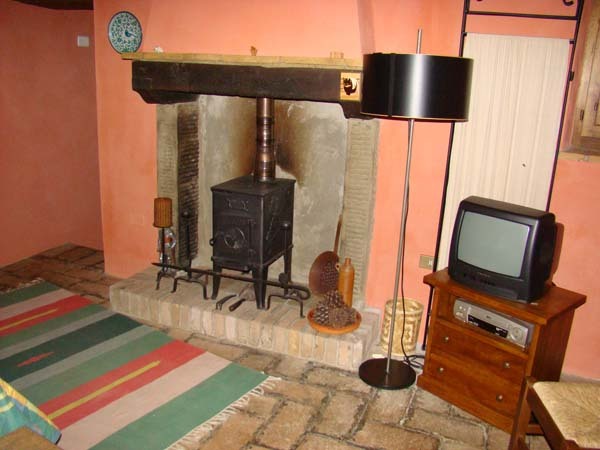 Heating in Italy: I don’t know if you have noticed but wood burning pellet stoves and fireplaces are an important part of houses here. The Italians, in all their wisdom, have decided to buy electricity from France and Switzerland rather than produce their own. This results in very expensive power. Gas is the alternative and it is also prohibitively expensive. Therefore everyone here heats with wood. The apartment: We rented the flat where we are staying from Lynda who lives in England. 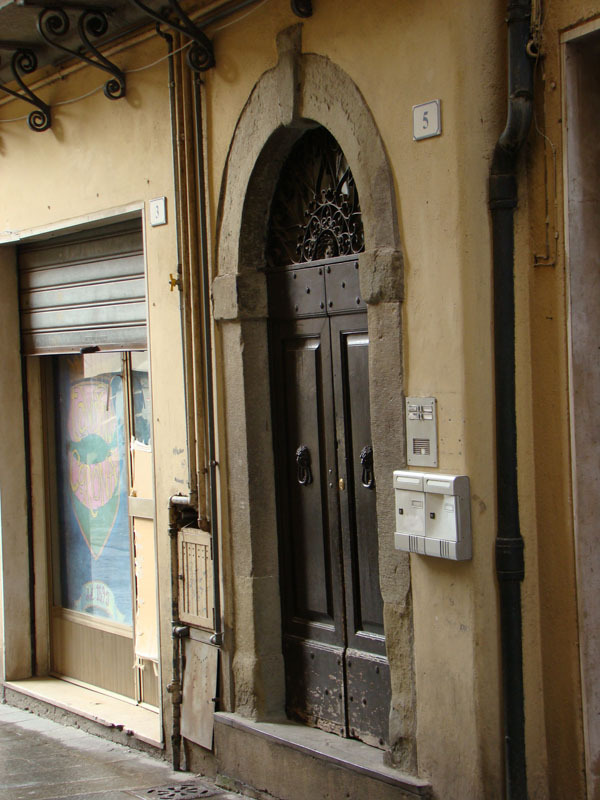 She lived here in Umbertide in various houses with various husbands over 20 years. She doesn’t normally rent her flat but Jim (our realtor) is a friend and asked her. She picked up a quick 750 euro so good for us all. We thought that was pretty reasonable for 3 week rental. We won’t use the entire 3 weeks but that’s OK. It is a really nice space on the top floor with views of the Tiber. It has a really large open plan living room, dining room and kitchen. Nice terra cotta ceiling with beams. Tile floor. Cute little wood burning stove in a big fireplace. One large nicely appointed bath and a nice bedroom with a couple of wardrobes and a dresser. I couldn’t have asked for more except it has no TV or internet. It is funny how much you want these but we are managing. Susan and Gary (new friends) have loaned their extra apartment to us a few doors down up 68 steps (!) to use that internet. It is the only way I have been able to keep in touch. I go over one or two times a day to check mail and update this blog. We have also been watching a lot of DVDs that Lynda has here in the flat. Of course there is the big Wednesday market with all the produce, cheese, processed meat and fish. On Friday there is a fish truck that sets up shop on the street nearby. I glanced at the fish (straight from the Adriatic) and they looked wonderful. Nice to know that even though we are land-locked here in Umbria there are fish sources. In town are several restaurants and pizzerias. We have dined twice at one in a hotel that has quite good and very reasonable food. The folks are friendly. We ate at La Rocca which is a fish restaurant. We ate the best place in town (forgot the name) one night. It is a beautiful space with a little tiny menu but everything we had was great. There is this ravioli type pasta called mezzelune which is half mooned shaped. It is filled with soft cooked egg and topped with asparagus and bacon. Jim says they stir up the egg and freeze it in little chunks. Then they wrap pasta around it in the half moon shapes and drop it in the water. The boiling water cooks the pasta, thaws and soft cooks the egg so when you cut into it the egg runs out. It was really good. We were the only customers the whole night. Jim says it’s because it’s winter. There are lots of good pizzerias around as well. Friends we have made: Before we left on this trip I had been reading everything I could find about places in the area. I found many blogs with information about places near and far as well as expatriate websites that are a wealth of information. One blog is called Americans in Umbria. Through this site we “met” virtually Susan and Gary who live in Umbertide. It was they who inspired me to try this town. Susan and I wrote back and forth for a couple of months and when we arrived here we met at a bar for a glass of wine and then on Sunday they drove us up to Montone, a nearby hill town, to have lunch at Erba Luna, a really nice restaurant in that town. We also visited their lovely apartment down the street from our flat. It is very spacious and beautiful. We have enjoyed them very much and hope to become fast friends. As mentioned earlier I found Don and Jodi in Castiglione del Lago. I made contact through Trip Advisor and we finally met in person on this trip at a little café called Café Alise. They have a lovely home with many cats. There is an apartment on the ground floor that they rent out to vacationers. They have a lovely yard with olive trees and a summer kitchen. A little piece of heaven. Don and Jodi had introduced us to Bob the Builder via internet (an Englishman who’s been in Italy for 25 years). We met him with them that day. We agreed to let Bob find some properties that were not formally listed through agencies as they could be a better bargain. In my house hunting posts I tell of our experience. Natalie and Paul are friends of friends. They live in a village between Umbertide and Citta di Castello. We met because friends of ours winter in Florida in a hotel which turns out to be a favorite of Italians coming from New York and New Jersey. In conversation they mentioned that we were looking in Umbria soon and were given Natalie’s email. I wrote to her and she replied very helpfully. We have not met them yet but plan to meet at a pizzeria for dinner soon. (Later) – we met Natalie and Paul and had a great dinner at a pizzeria up the valley. They are very nice folks and we hope to get to know them better once we move. They have been here permanently for about a year and a half. We also have not actually met but plan to meet John who has a house in Montone and has just retired. He and his wife plan to move for at least a year to try it out. Hopefully we will meet them someday after we actually move. So I guess it pays to network no matter where you live! This entry was posted in Umbertide, Umbria, Uncategorized on January 25, 2014 by Nancy Hampton. This morning we met up with Jim. We also invited Susan and Gary to go along and see the apartment that we like. It was pouring rain. What’s new! We all tromped down the street 2 doors from Bar Mary. We buzzed and entered. This building has really pretty marble staircases. Not like the other staircases we’ve seen. We were all being very quiet because this was the building of the crazy lady we had seen a couple of days before (the one with the cantine and big garden but junky apartment). After tiptoeing past we went up another staircase and then into the apartment. You enter and there is a final staircase up. At the top is a glass door. The floors are all wood (not our first choice but there you have it). Susan and Gary seemed to like it. You turn left and enter the big living room which has the big picture window out to the river and a big dining table. There is a sectional and a big flat screen TV in this room. Also a pellet fireplace between the table and the living room which keeps the room toasty. Out the door to the left is a bath with shower and washer and dryer. Across from that is the big room outside of the kitchen with closed up fireplace and refrigerator. There is a table in there and a long storage counter that is made of metal. Then there are the 3 bedrooms and another bath. 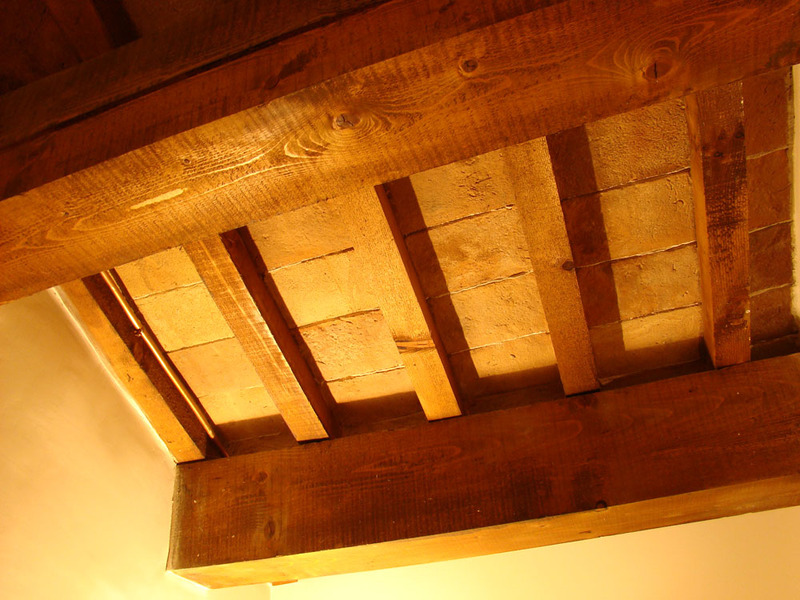 These last rooms have barrel ceiling that are original and very old. I love them. The living room was bombed in the war so the ceiling is new but built of terra cotta and giant wooden beams. Susan and Gary told us they thought it was a “find”. Below are pictures of the the house from the back (white center), terrace from the back, the picture window in the living room, and the apartment door. We went to Bar Mary with Jim and decided to make an offer. We tried to get our codice fiscal stamped but we have to wait until Monday. We went and had it copied and our passports etc so Jim could do the offer. He had an appointment so we went back and had lunch in the flat. Jim came back and we all went over to the other agent’s office where we signed the offer. It is all pretty straightforward. Jim already went to the land office and says as far as he can tell the title is clear. Now the owner, Elizabette, has to decide. She has 4 days or until next Tuesday. We had a beer with Jim and parted ways until Monday when we will get our Codice Fiscale stamped and open a bank account. We have 20 days to transfer the money so can do that when we return. We will give Jim a power of attorney to write the check and finish the deal on our behalf. The closing date is April 30 if all goes well. Tonight we have dinner with Natalie and her husband who are friends of friends in the states. Tomorrow and Sunday are finally free for us to do something else than look at houses. It has been a fun, busy, and stressful time but I will always remember it and not in a bad way. I hope it stops raining soon! 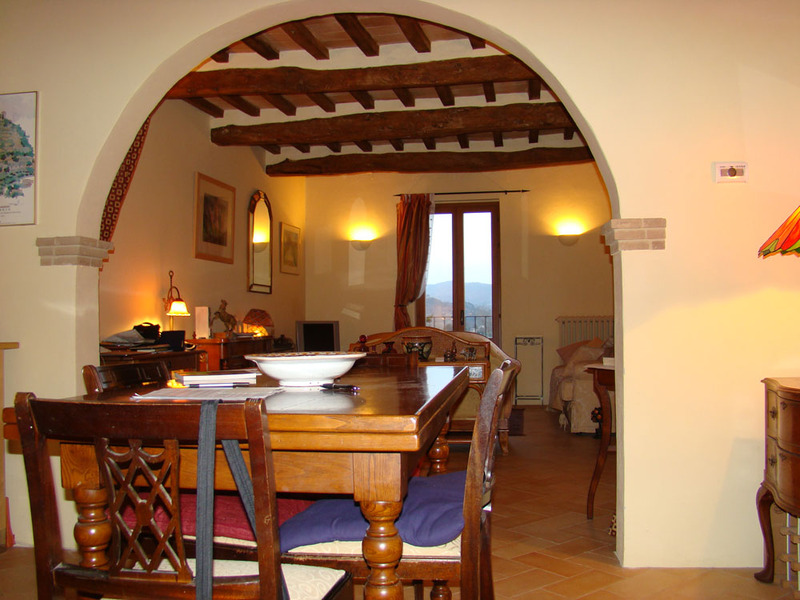 This entry was posted in House Hunting, Real Estate, Umbertide, Umbria, Uncategorized on January 25, 2014 by Nancy Hampton. Today we had an appointment to re-visit the house with all the floors in Umbertide Centro Storico. We had our cappuccino in Bar Mary and met up with Jim. We first went to the place we saw before. It wasn’t quite how I had remembered it but it still had plenty of potential. Jim had found a number of properties other than this one all within walking distance of there. The first place was just outside the Centro and was nice with a big private garden inside of a gate. The house was warm and well insulated. It had a heat pump! With AC and heat. It had a big roof terrace. Nice kitchen, 2 bedrooms and 2 baths and an extra room for an office. Lots of out buildings and storage. Nice but didn’t ring my chimes mainly because it was surrounded by taller ugly newer buildings. Luther said he could imagine us outside with friends being overlooked by all the neighbors. And those little old ladies in Italy do like to snoop! Next we walked back into the Centro Storico and saw an apartment above the apartment we saw a couple of days ago with the big Cantine and garden. This one was the top floor. It was really beautiful. It had a large living room with cathedral terra cotta ceiling (picture below) with a big sectional and a big table with a big picture window looking out on the river. In that room was a pellet fireplace. The ceiling was new because the house had been bombed in the war. 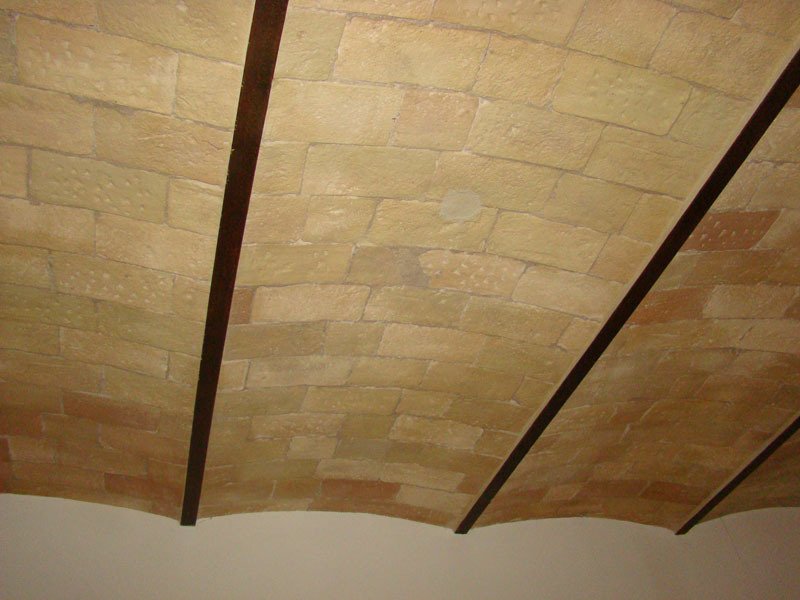 The rest of the house had beautiful stone barrel ceilings that were original and old (see below). There were also 3 bedrooms and 2 baths. There was a lovely terrace bigger than the others we’d seen overlooking the river (see below). There were built in closets. The downside was the kitchen. It was a little tiny space over in a corner through a 3 foot thick wall. It was well appointed but small. It was entered out of a large room with fireplace and the refrigerator was in this room (!). I am thinking that room could possibly be made into the kitchen. It is a dining room now but the big table in the living room could be dining space. The kitchen would be very big with the fireplace if we could pull it off. OK I guess you know that this place has pulled ahead. Luther and I both like it and we plan to make an offer. We did see one more new built place about 10 minutes walk from the Centro. It was big with an underground garage and storage space. It would be finished to our specifications. This also didn’t ring our chimes although it sat right on the river next the park. It was quite nice. We rang Jim and tomorrow we will revisit the house we liked. If we still like it we will enter into the negotiations. It can be sold furnished which would be our wish. The lady who owns it said sadly she did not want to sell but her husband did. Cross your fingers for us!! 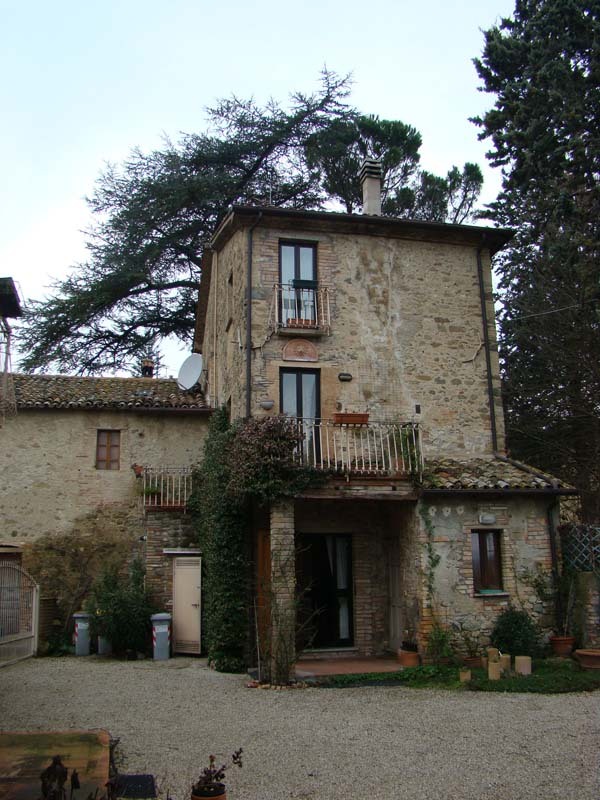 This entry was posted in House Hunting, Real Estate, Umbertide, Umbria, Uncategorized on January 24, 2014 by Nancy Hampton. We went to Bar Mary where we get a cappuccino every morning. It was Wednesday and the weekly Wednesday market was in full swing. 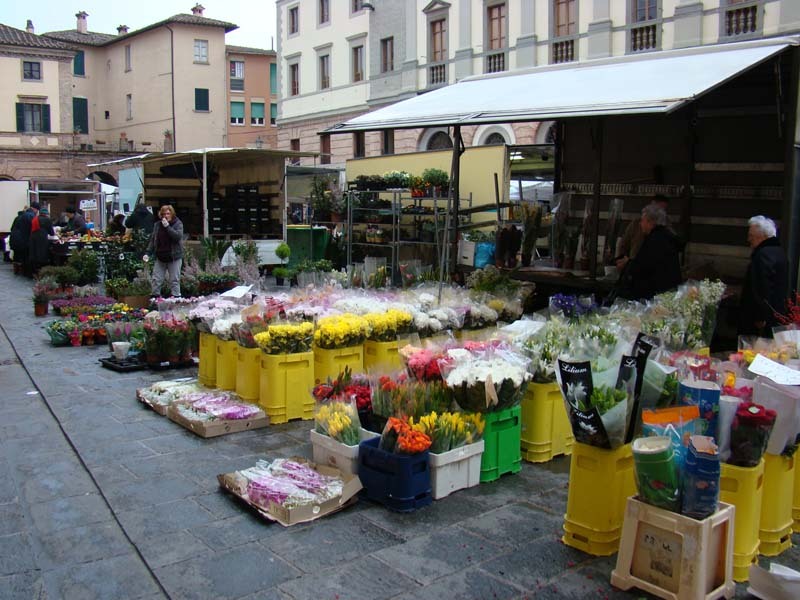 It was a perfect sized market with vegetables, fruits, dried and fresh fish, cured meats, cheeses, bread, and flowers. On the other side of the town was the market with other kinds of goods like clothing etc. We headed out over the mountains again. Did I mention it has rained EVERY day? It was very foggy in the mountains this time, making the trip slower. We arrived in Paciano right on time. We visited the house we couldn’t get into the other day. It was a pretty nice place. Luther said if we’d seen it first we would have been wowed. It had two floors that would be separate apartments. They both had nice gardens and parking. Luther thought it would be very expensive to heat them. We marked this off of our list. We wandered around Paciano. We peeked into the wine bar. There were a number of folks in there. At the bottom of town we checked out the Alimentari (small grocery). It was very small but had most everything you’d need. There was a butcher shop in the back and fresh vegetables. Next door was the second bar. It was also nice. We walked up the hill and looked into the Pizzeria which was closed. There was also an appliance dealer with things like toasters, irons, etc. We drove over to Panicale so Luther could gauge the distance for his jog. It wasn’t too hilly. We met up with our agent and the owner of the house. We took some movies and pictures. We realized the rooms of this house were much smaller than we remembered. It does have a lot of outside space. There is a big balcony with a planter just off the kitchen which is nice. You could put tables and chairs there. Did I mention this house has screens? This is nearly unheard of in Italy or Europe for that matter. But they are really nice to have. We still liked the house but it is very small. We went into Castiglione for lunch where we had eaten before. It is in the center of town but the food is pretty good. I had a pasta with the lake fish. Luther had a Trasemino specialty of beans with fish (right up his alley). We had an appointment with Bob the Builder next. We met up at Café Alise and we followed him to a property that was in the flat farm fields. It was very beautiful but needed total renovation. Turns out it had been sold but I took a picture. Then we drove WAY out in the middle of what I would call nowhere. It was down a long dirt road. The house was not bad. It had 4 bedrooms and pretty good living spaces. It had a fenced yard and was surrounded by woods. It was not to our liking. Lastly we went to a house that was essentially a shell. It was waiting for a buyer and then it would be finished to their specifications. Again, not what we were looking for. We always learn a little with every viewing so this was time well spent and we appreciate Bob’s time. Monday we resumed our hunt after a relaxing break on Sunday. We drove back up the Niccone valley, over the mountains and back down to Lake Trasamino where we had appointments with two real estate agents. The first one took us to Piana, a small village not too far from Castiglione. The house was right in the village center which is what we like. It was funny though because it has 3 double doors that opened from the front … wait for it … right onto the road. You truly had to look right and left before you walked out! It needed a lot of work but was livable and pretty good sized. It had a small garden area outside on the street and a private paved patio out the back mostly taken up with a shed. That would have to go should we buy it. We are not sure how much of a renovation we want to do. Next up was far out into the agricultural countryside not far from a village. A beautiful situation but pretty isolated. It had nice gardens and gorgeous views. The rooms were nice and didn’t need renovation. Lots of storage and a decent kitchen. It was just a little too far out of a town for us so that is a no-go. Last was a new build back in Paciano (remember that last house on the hill? Same town). It was probably a little closer than the front running house and not uphill from the village. The only problem was the keys didn’t work and we were unable to see it. Too bad. Good prospect. We decided to re-try to see it. On Tuesday we met up again with Jim who we had seen our first day in Umbertide. He took us to two properties in the town medieval center, both just next to the apartment where we are staying. Both had nice Tiber river views. The first one you entered into the house from the street and up a staircase straightaway. This emptied you into a living room area. You went through a doorway into a kitchen which would need total renovation but had great views. Jim suggested we knock down the non-load bearing wall between the two rooms to make a nice big open space. 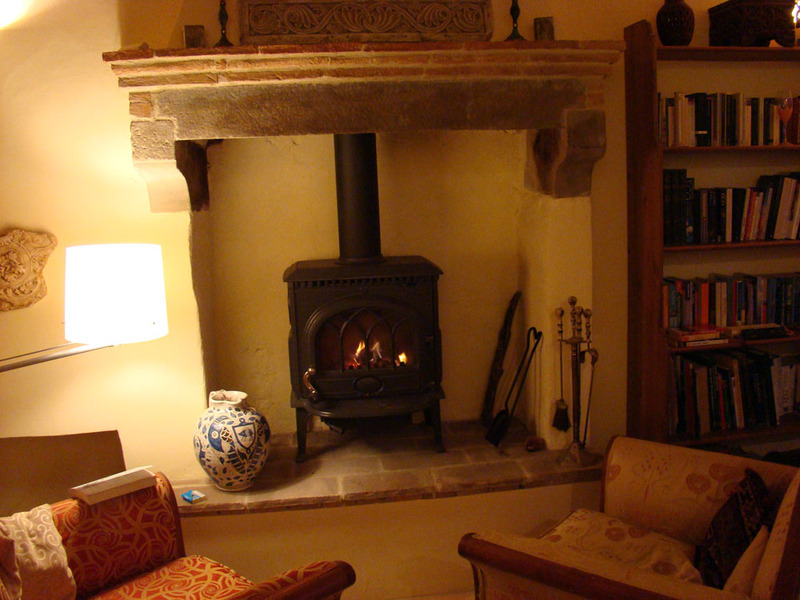 There was a flue for a pellet stove to keep the space toasty. All the floors in the place were terra cotta tiles. The ceilings had massive beams. Continuing upward the stairs opened out into a large living room type place with a fireplace. There was a wall between it and a bedroom with bath. Jim again suggested we ADD a wall to close off the living room space and open that room to the bedroom to make a master suite. What a good idea! That would make a corridor to the next set of stairs. Up these stairs was another bath with a door to the terrace (!) OK strange but Italian. The room next to the bath also had a door to the terrace so you didn’t actually need to go through the bath to get to it. That room could be an office or library. There was also a big bedroom on this floor with large sitting area. It could be a very nice guest suite. Top floor – yes there are a LOT of floors! (actually you’d own nearly the whole house except for a shop on the street level) – was an attic space with sloping ceilings. It had really ugly paneling straight out of the 60s on the ceiling and some walls. It was a very big space with another bath. Potential in this attic space for sure but it doesn’t need to be finished right away. This one had potential. The next house was just 2 doors down. It was a hoot. An old quite eccentric woman owned the place and let us see it. It was a real rats nest. Very hard to envision it looking nice. There was a big room with kitchen, another room with bedroom and a storeroom. The strangest thing was you had to open a trap door (!) and go down a steep narrow ladder with barely room for your feet. It was pretty scary but we got down to the bottom, which was the way to the garden. Yes, that was the big selling point for this house. It had a pretty big garden, which was a vegetable garden. Really nice. In the bottom story of the house next to the garden were a series of cantine or large vaulted rooms. They went far back into the earth with arches inside arches. It was full of junk and Jim said they could be made into a spectacular space but I was having trouble seeing it. Ultimately we don’t think this one is on our list. He took us up the valley to San Leo Bastia, a small village with a bar and restaurant and small grocery. The house was just lovely. It is owned by a British couple who used it for a summer home. It is a cottagey place made of pretty stone. Getting to it was pretty harrowing. Jim has a big Land Rover four-wheel drive which he expertly uses. It climbed right up but I can’t image a regular car going up there. The house had a really nice kitchen dining area opening to a nice living room with pellet stove. There was a shower room on this floor too. Up the steps you entered a “snug”. It is a Briticism and is totally descriptive. It had a sofa and a wood burning stove and it was just… snug! There were two bedrooms and a bath on this floor too. Outside was spectacular. The house was halfway up the hill overlooking a valley and onto the hills opposite. There was a gorgeous covered dining area with lots of inside and outside space. I am sure it would be lovely to sit out there in the summer. We really liked this last property but the village, while cute, was pretty small with very little in it. I think this one is also not on the list. Lastly Jim had contacted a colleague in Citta de Castella. This town is about 2 times the size of Umbertide and maybe 30 miles north. It is a really pretty completely walled city. The apartment we saw was in a beautiful palazzo with a beautiful staircase with arched ceilings. The apartment has one bedroom, one bath, kitchen, formal dining area and nice kitchen. The surprise was a spiral staircase up to the terrace, which was very nice and just level with all the smoking chimneys. I guess this wouldn’t be a problem in the summer ! Off to the side was a little, tiny door you had to climb up to and crouch to get through. Once inside was a very large attic space. Plenty of room for a bedroom or two and a bath. You would have to lower the floor to make it level with the terrace and you’d have to add a staircase from downstairs to make it easier to access. We really don’t want to undertake this kind of project. All in all a pretty productive day. We have a new property on our list! 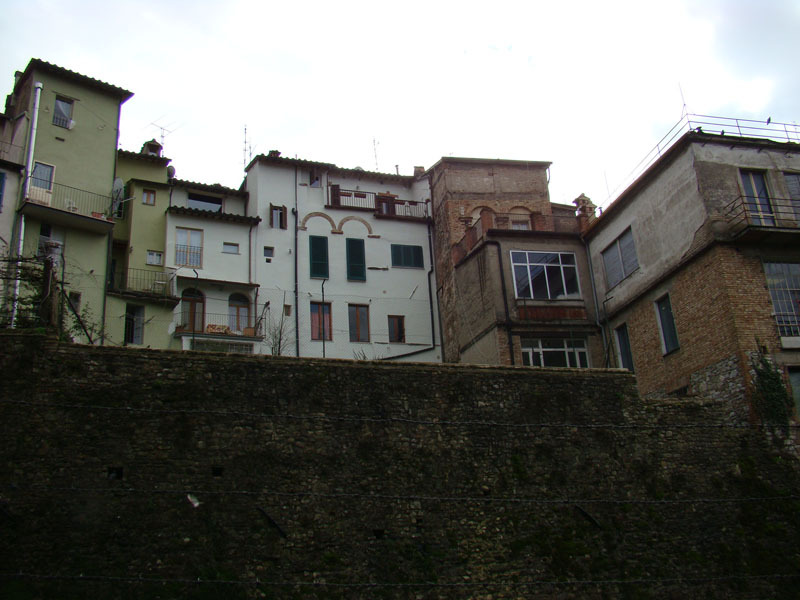 The first house in the medieval quarter of Umbertide. Now we have two potential houses, both TOTALLY different in every way but both have their pluses (and minuses). These houses would be the one in Umbertide that we saw today that needs mostly cosmetic work. And the brand new house we saw in Paciano on day 3. There are many things to take into account on these houses not least important is the completely different feel of the two locations. Umbertide is more of a “real” Italian medium sized town, slightly gritty, dating from the 6th century BC. It became a Roman city in the 3rd century and later, in 1189 it was first documented as under the rule of Perugia. 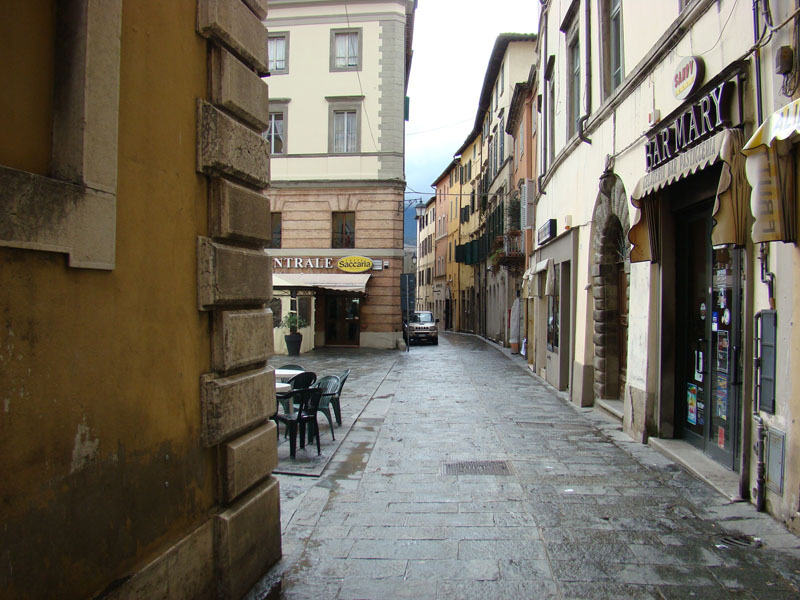 It has a compact Centro Storico with restaurants, piazzi, bars and tiny streets. It is not terribly picturesque outside of this area but it has all the things you’d need. Good stores, hospital etc. Train connections are not the best but existent. You could train to Perugia and then switch. Paciano is a tiny hill town, completely restored and it feels kinda like Disneyland. It is almost too perfect and pretty. 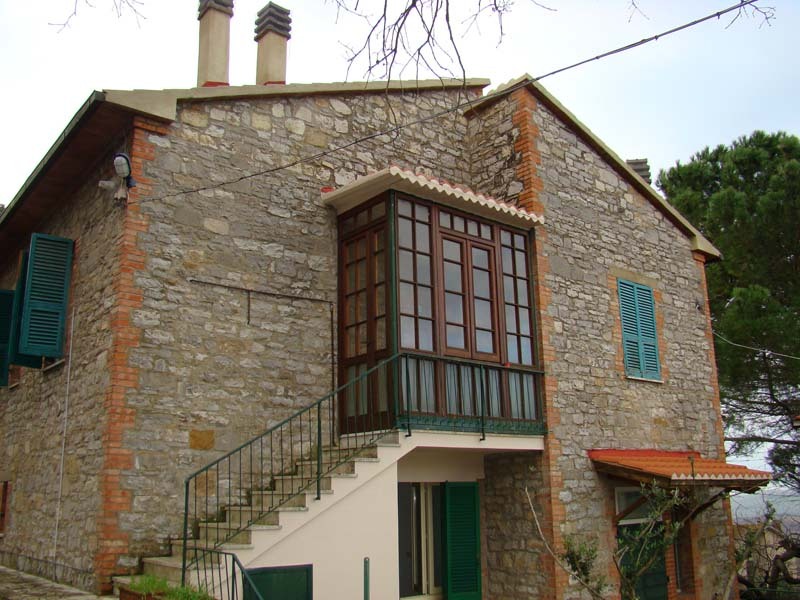 The location of the house is up high and airy and very tranquil but walkable to the village. There are a bar, 2 restaurants, a pharmacy, a wine bar and a small grocery in town which is good. But it is also only 15 minutes to Castiglione with all the big stores etc. Better train connections in town but the high-speed line is in Chusi only 15 minutes away. We have new friends in both locations whom we would love to live near. This also makes it so hard to decide!! We will see a few more tomorrow and re-visit the Umbertide house on Thursday but time is growing short and we need to make that decision soon. 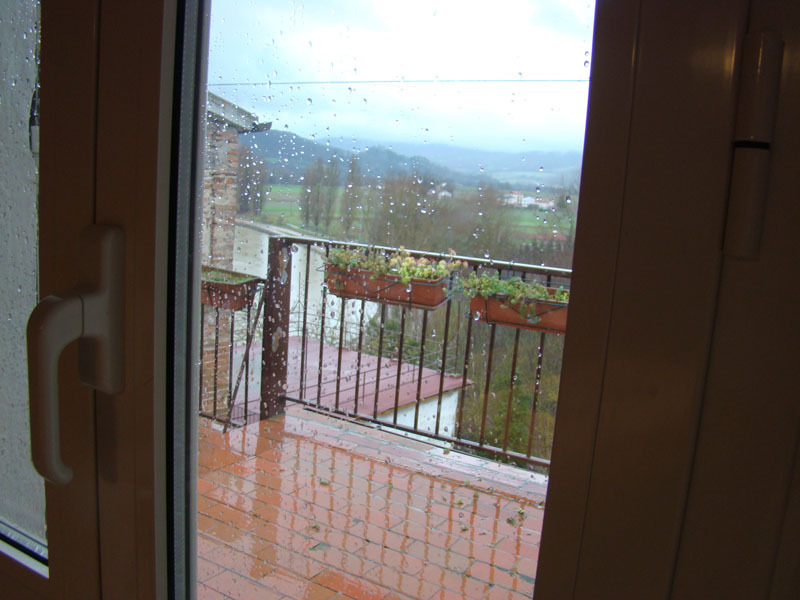 This entry was posted in House Hunting, Real Estate, Umbertide, Umbria, Uncategorized on January 23, 2014 by Nancy Hampton. Well it’s been three days of whirlwind activity! We arrived in Umbertide (pronounced Um-BERT-teh-day we found out) at 11:30AM on Thursday January 16th. It was slightly overcast but not too cold. Umbertide is a town of about 15,000 souls with a nice compact centro storico (historic center). Our phone didn’t have enough charge to we resorted to a public pay phone (they still have them!) and called Jim, our contact. He had helped us find our apartment and was going to show us properties. We met up in front of the train station and went to our apartment to off-load our luggage. 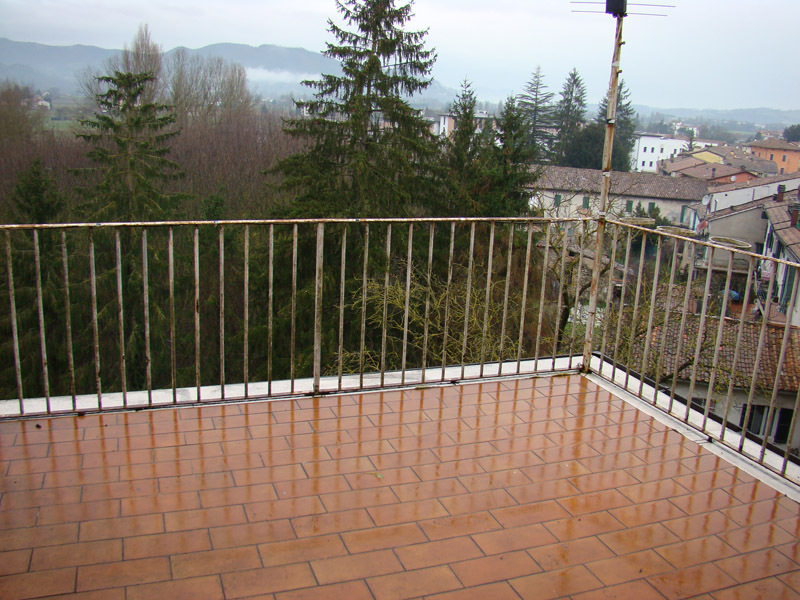 It is a lovely little apartment on the top floor with a nice view of the Tiber river. The only issues are no internet connectivity or TV. We headed down the street to Bar Mary which is Jim’s “office”. We had beers. Jim seems to know everyone! He has lived here 30 years and is thoroughly assimilated. We went to lunch at Il Capponi on a small piazza. We all had pasta and split a jug of the house red. Very nice. After that we went out to see some places. First we went up the Tiber river into the countryside. The house was in a small town. It comprised a main house and a guesthouse both facing what would be a beautiful courtyard garden in the summer. Jim said it was negotiable in price. The elderly owners have returned to South Africa. Picture of main house below. 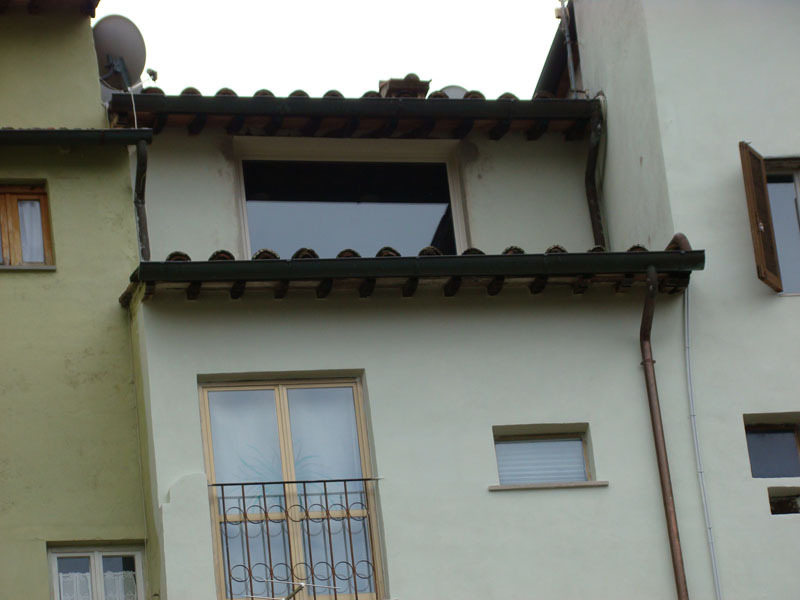 We next saw 2 apartments in Umbertide centro. They were both too small for us but quite reasonable in price – one was 120,000 Euro and the other 115,000. Both were also negotiable. We discussed our likes and dislikes and parted ways with Jim until next Tuesday at which time he will have searched out other properties for us to see. The next day we drove up the Niccone river valley into and ultimately over the mountains. Coming down the other side the view of Lago Trasemino (largest lake in Italy except for Garda – picture below) was spectacular. It was a gray day. Our appointment was with Mr. & Mrs. Nelson who owned the home we were seeing. It was a lovely home and they are a lovely oldher couple. They plan to return to England as their health is failing. There was a nice garden overlooking olive trees. The house had two floors separate from each other. Both had 2-ish bedrooms and a bath. The downstairs is the older part with pretty arches. The town of Puccinelli where the house stands is small and you cannot walk to anything like a bar or restaurant which is the downside. The following day we met two ladies from Bella Umbria agency. They took us to see 3 places. The first in a town, Tavernelle but too far to walk to anything and we didn’t care for it. 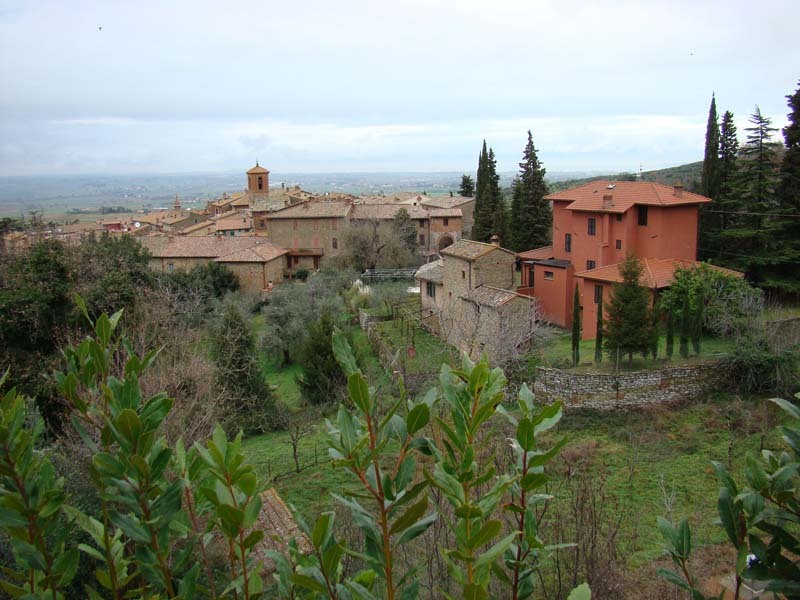 Then a couple of new build apartments down the hillside beneath the hill town of Panicale. They had obviously stood empty for a long time. They had garages downstairs. They were nice but not notable. The last house was one we had both looked forward eagerly to seeing. The pictures on the website were great. The house did not disappoint. It was stunning. 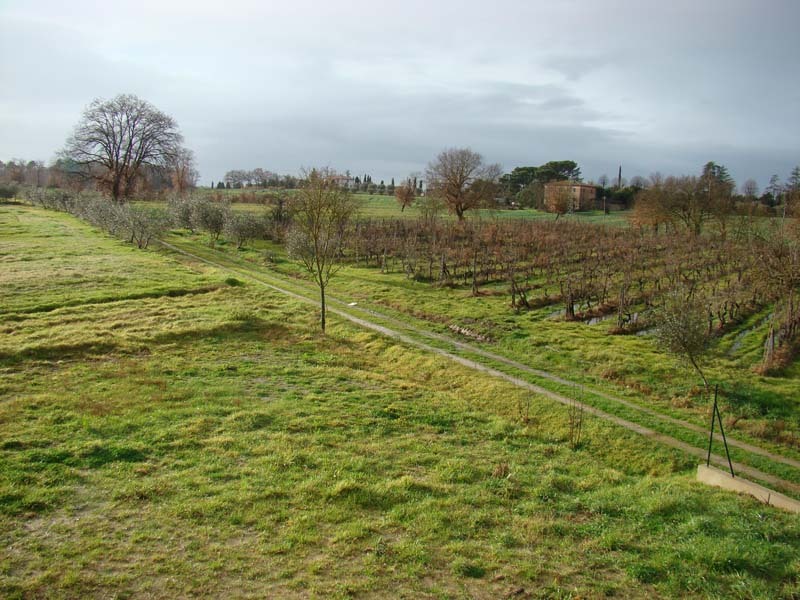 The view was nothing less than spectacular and it was just above, and within walking distance of Paciano – another hill town. The builder came and met up with us. None of them (including the 2 real estate agents) spoke much English which made it a bit difficult. The apartment was on the top floor of 3 and was brand new. There are two bedrooms plus a small office or large changing room or even a single bedroom with 2 very nicely done baths. There is an open plan living room with kitchen and dining space. It was the highest rating for energy and had a fireplace in the living room and one in the main bedroom as well as a pellet stove all as additional heating to the gas. The floors were tiled in the living area and wood in the bedrooms. It was completely wired for internet and TV. We drove down to Paciano to park and explore. The town is beautifully restored. There are a couple of restaurants, bar, grocery and wine bar. We came away entranced with the third house but will wait to see all the others on our lists before we make our decision. 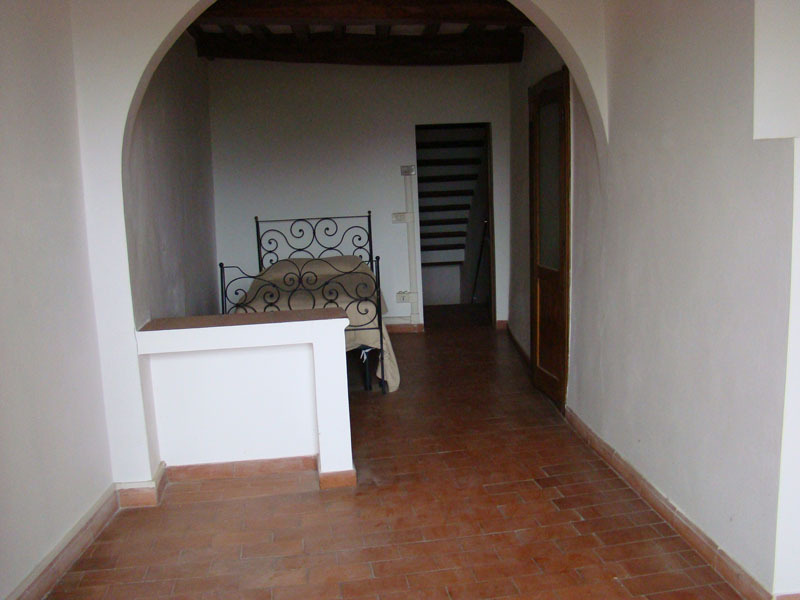 We still like the first house with the courtyard and the house with two apartments in Puccianelli. But this last one is more spectacular. Above is the view. Lago Trasimeno is in the distance. 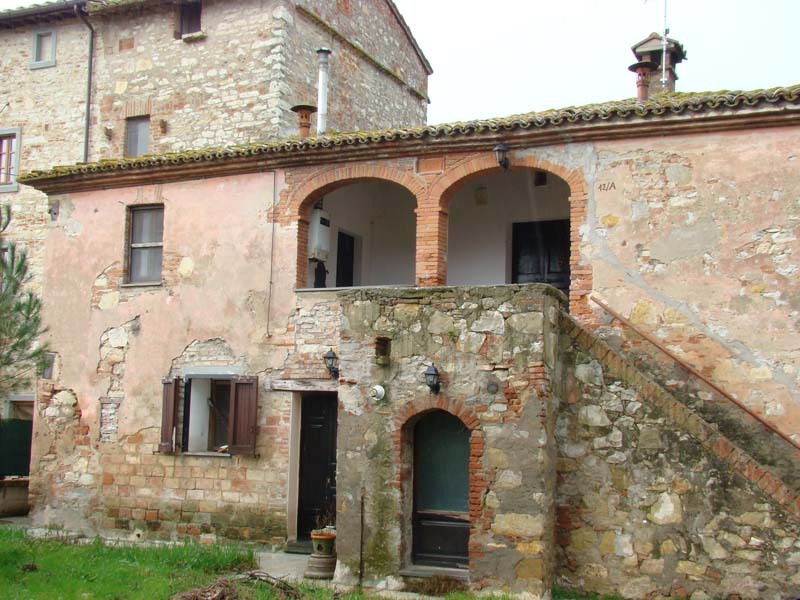 This entry was posted in House Hunting, Real Estate, Umbertide, Umbria, Uncategorized on January 20, 2014 by Nancy Hampton. Our bags are packed and we’re ready to go! We fly out of Washington National to Philadelphia and on to Rome. We arrive Jan 16 at 8AM. We rented a car from a new place called Air Transat that we heard of from friends who live in Canada. Much cheaper. We’ll see how it goes. The weather is in the 50s with a lot of rain and fog. But that’s winter for you. Not as bad as Virginia right now. I have been emailing like crazy and have set up appointments with 3 realtors. Most are based in the UK but have arrangements with Italian agencies. Since there is no MLS in Italy you have to contact everyone separately. One of these helped us find the flat we are renting in Umbertide for 3 weeks. He will be showing us properties in that area. We have appointments on the 17th, 18th, 20th, 21st and 22nd in various areas with various realtors. 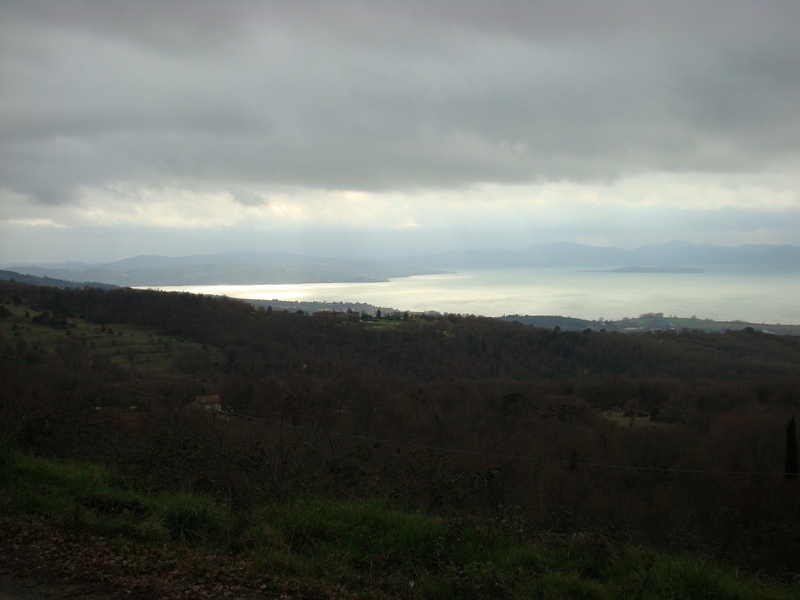 Then just 2 days ago I made contact with an American who lives in Castligone del Lago west of Perugia. This is the other area we are interested in looking for properties. It is interesting how I am growing a network there. There are so many ways to find people. I found him while googling the towns in the area and seeing a Trip Advisor restaurant review on a place in one of the hill towns there. I clicked his contact and sent a short email. He got right back to me and we’ve been having a lively discussion. He’s been there since 2008 and loves it. He gave us some advice that we were grateful for about markups with foreign realtors and the fact that many properties are not listed with agencies and you have to know people. He pointed us to a local Italian builder – he called him Bob the Builder. He does renovations for most of the British who live there. He is also local and plugged into the property network. Now I have made contact with Bob the builder and plan to meet him on Friday the day after we arrive. He is scouting around even as I type to find things in that area that could be available. 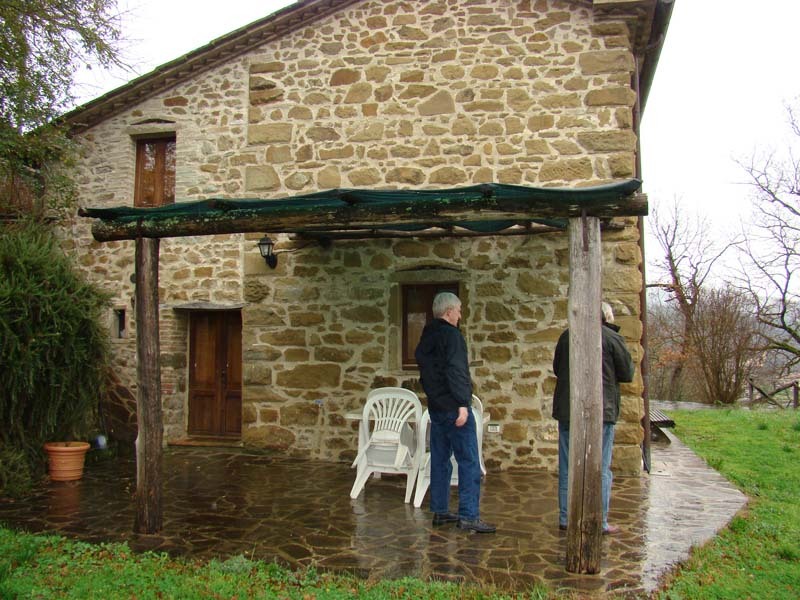 This entry was posted in House Hunting, Real Estate, Umbertide, Umbria and tagged Umbertide on January 14, 2014 by Nancy Hampton.